U.N. Syria Envoy Staffan De Mistura Is Stepping Down De Mistura told the U.N. Security Council he was leaving for "purely personal reasons." In his final month, he plans to make a major push to try to lay the groundwork for a new constitution in Syria. U.N. Special Envoy for Syria Staffan de Mistura, shown here at a conference in April, says he will leave his post the last week of November. After more than four years as the U.N. Special Envoy for Syria, Staffan de Mistura is leaving his post. He says that in his final month, he'll make a major push to try to lay the groundwork for a new constitution in Syria. De Mistura told the U.N. Security Council on Wednesday that he was departing for "purely personal reasons," and would wrap up the last week of November. He said that has always been his plan. Still, he added: "A month can be a century in politics." During his tenure, the dynamics in Syria's conflict have shifted dramatically. There is only one rebel stronghold left, in Idlib province, since the civil war started some seven years ago. Last month, as NPR's Ruth Sherlock and Lama al-Arian reported, Russian and Turkish leaders announced a plan to set up a demilitarized zone there to try to prevent large-scale bloodshed. 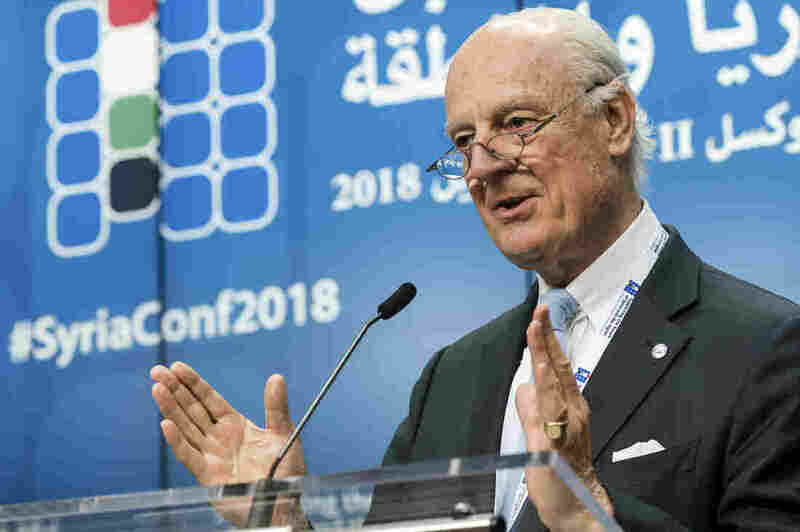 "A catastrophe has so far been averted in Idlib, and the Russian-Turkish memorandum of understanding appears to be being implemented," de Mistura told the U.N. on Wednesday. He said this opens up a "window of opportunity" to push forward with selecting and convening a committee to come up with a new constitution for the country. That process is running into roadblocks at the moment, and he blames the Syrian government. The committee is expected to be drawn from three lists, with 50 people from the opposition, 50 people from the government, and 50 others who de Mistura said represent "Syrian experts, civil society, independents, tribal leaders and women." However, de Mistura said that Syrian government officials are calling for a "fundamental reassessment" of that third list. He said he plans to travel to Damascus next week to speak to Syrian leaders about the process. Ultimately, he says, the U.N. secretary-general has asked him to use this month to "verify whether the U.N. is in a position or not to convene a credible and balanced constitutional committee and report to the Security Council accordingly." Syria's U.N. ambassador, Bashar Ja'afari, expressed opposition to drafting a new constitution at the Security Council meeting, The Associated Press reported. He was quoted as saying that the constitutional committee should "renew the current constitution — current constitution — because we do not want a constitutional vacuum, because Syria is not a failed state." De Mistura was preceded in this role by Lakhdar Brahimi and Kofi Annan. At the time, as NPR's Eyder Peralta reported, then-U.N. Secretary-General Ban Ki-moon expressed disappointment and stated that both envoys had "not been able to make any progress." In an interview with The New York Times, Jan Egeland, the secretary general of the Norwegian Refugee Council, praised de Mistura's "herculean effort, every day, every night, every weekend" to try to end the conflict. "It's been one crisis and horror after another, from Homs to Aleppo, to Raqqa to Eastern Ghouta to Daraa and now Idlib," Egeland told the newspaper. "There never seems to be a good time to step down."